Beatrice Ryan Designs… Week 10 CAL Instructions!! So here we are… Our final week! I have enjoyed making this Crochet-A-Long with all of you so much!! I love the way it turned out and I sure hope you do to!! Let me know what you think!! * To complete your edging you will make the last 2 rows using the same color… I chose to use my neutral, but you can make it with any of your colors you prefer! Row 35: You will be working in the Back loops for this row. Join with Sl St to any stitch in the Back Loop. Ch 1, Sc in the same stitch (Back Loop Only), *Sc across to corner stitch. 3 Sc in the corner stitch*. Repeat * * around to the beginning. 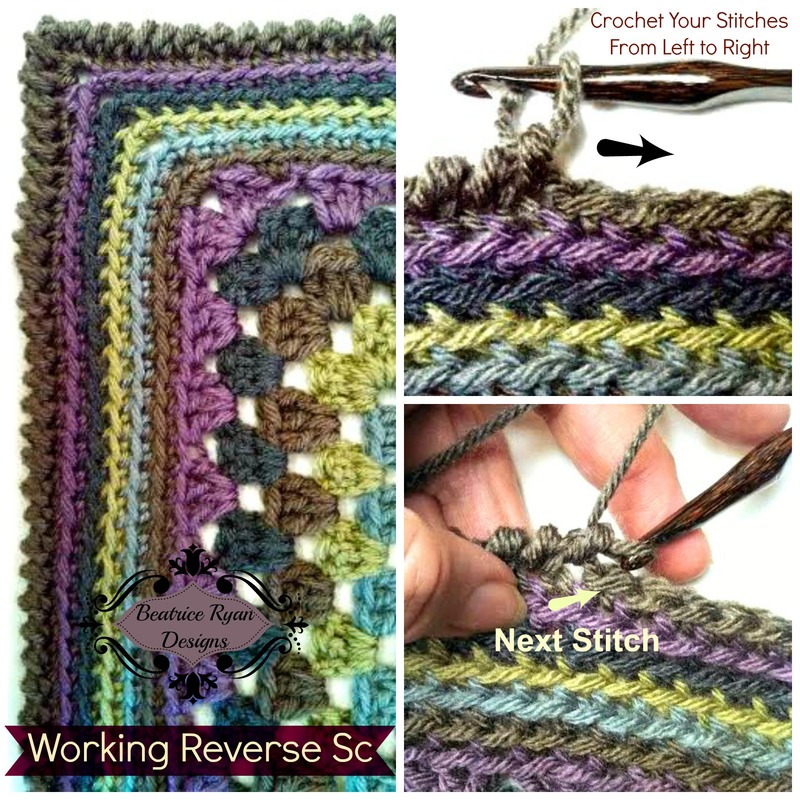 Join with Sl St.
Row 36: Working in both loops and using the Reverse Single Crochet, Ch 1, Rev Sc in first stitch to the right and each stitch to the corner. *3 Rev Sc in the corner stitch, Rev Sc across. * Repeat * * around. Join to beginning. Finish off. Weave all loose ends in. 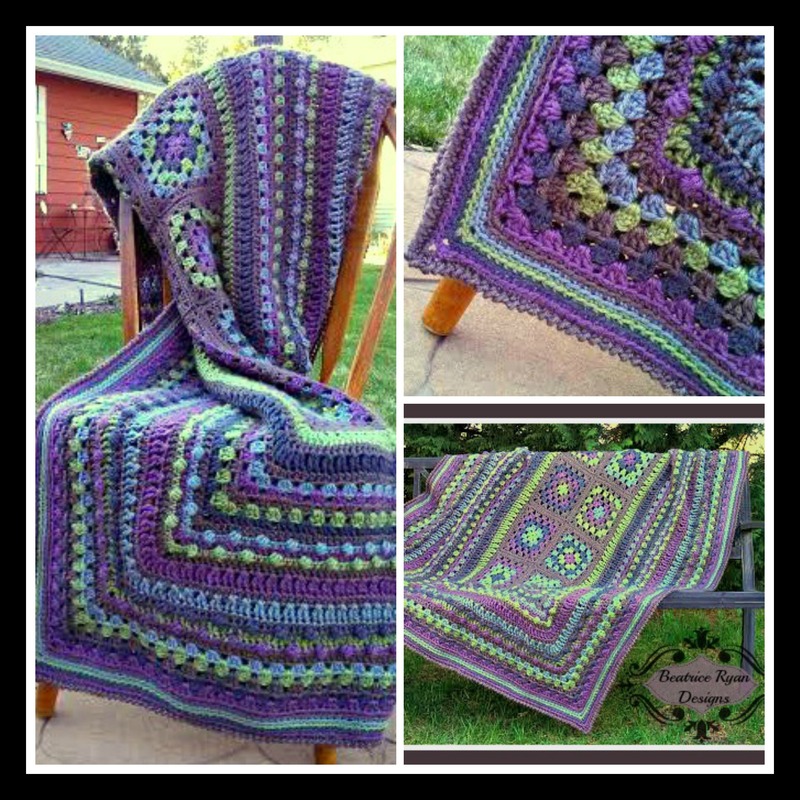 You may want to steam block or wet block your afghan into the final shape. This will help make it nice and straight!! Charlie,, Always ready to help and always guarding my crochet!! Now for the GIVEAWAY!! You will have 10 full days to complete your project. You must have all 36 rows complete to qualify. On Tuesday April 1st 2014 you will need to either email me your completed picture to [email protected] or post your picture to ourSpecial Facebook Finale!!! All pictures must be submitted by Midnight PST to qualify. The winner will be drawn at random and will be announced on Thursday April 3 2014! Good Luck!! Over the next few weeks I will be putting a collage/gallery together and posting various pictures of all of your wonderful afghans!! Thank you all for participating and stay tuned for more free patterns!! Congratulations on a fun and successful CAL. Your blanket is beautiful. Have a great day! Thank you Carolyn!! You too! Sure… What ever you like… Another boarder will make yours individual! I cant wait to see them!! I am having so much trouble with the border. I think I am going to have to do something different. Thanks again for doing this it has been so much fun and I am excited to finish my first big afghan. It will be fine to make whatever boarder you like… What kind of problem do you have?? Sorry if this is posted twice, it didn’t look like it posted. I am having trouble with the corners. When I do the three reverse single crochet it just gets all messed up and when I try to do the next stitch it is kind of over lapping the corner stitches. It’s kind of hard to explain. I have been trying to do the reverse single crochet but I am finding it hard to do, I already crochet from left to right all the time, I am self taught lefty. 🙂 I am doing 1 rnd of half double crochet as my border instead. 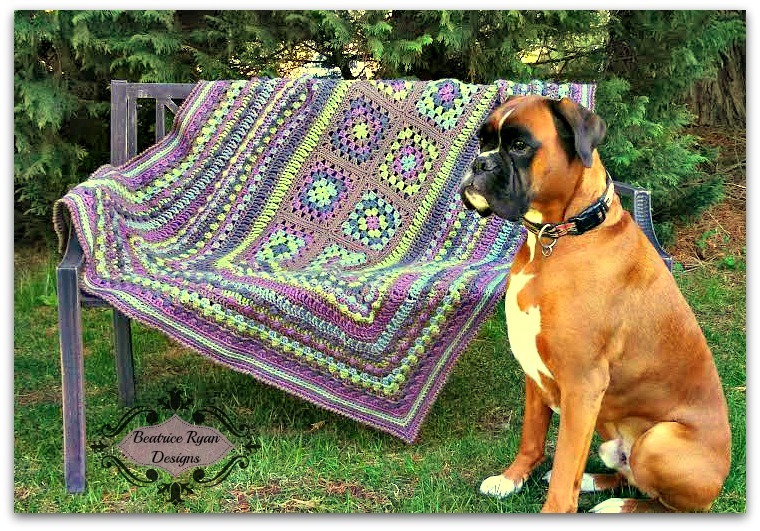 I may have to do this pattern again for myself this has been a big hit with all my family and friends that see my pics. Jenni, What ever works best for you is great… if you go left to right,,, you could try going right to left… It is a nice look… I am so happy everyone likes it!! Thank you Lynn!! I do love the way my afghan turned out… My daughter picked the yarn and she is very artistic… And both Charlie and I thank you for the compliment!!! It didnt come through here in the comments… so try emailing it to me… I cant wait to see it!!! I am so happy you participated!! Came late to the CAL so I am going to catch up by myself, Thank you for the great instructions. I am going to do this one week at a time but just excited to try! Hi Elena! I am finally getting around to finishing my blanket. I am curious though, what was your dimensions on your completed ‘ghan. I am finishing the last granny row and I feel like its too short for my tastes so I am debating on repeating the trebles before doing a border.